In a recessionary economy and dropping demand for products and services in the market, outsourcing might be the life-saving and cost-effective move your business can make. And not just only for the cost benefits that you can gain from outsourcing. The ability to shift your business' focus to more strategic tasks like building customer relationships can take center stage in an outsourcing setup, if done effectively. Know your business objective of outsourcing – Is it to reduce cost, generate more revenue or gain a competitive advantage? 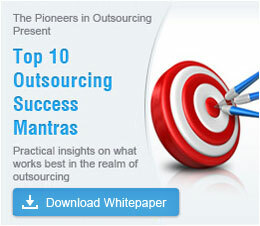 Identify which of your functions or assignments need outsourcing and rethink why they are best outsourced? 1. Can you actually do the service? or what service(s) do you provide? Many a time vendors promise to provide all kinds of services but often lack the necessary expertise in the service that you want to outsource. It becomes therefore important that you verify that the vendors you have chosen have the necessary skills and expertise to carry out your services efficiently. While working in a remote environment, communicating quickly and flawlessly can help speed up the project and resolve issues quickly. Check if your vendor has quick and efficient communication lines and has many options to get in touch with them quickly. The last thing you want to happen is your project getting delayed because of a slow internet line. 3. How much do you charge for the service? Though a basic question, this one will help you know what to expect to pay – if there are a large number of providers. It can also help you tell if there is sense in outsourcing if the cost of doing so is comparable to local conditions. 4. What security measures do you have in place? Security is perhaps one aspect that many first time outsourcers overlook. However many outsourcing deals have gone bad because security was not given its due. If you are dealing with sensitive information in your outsourcing assignment then it becomes necessary to safeguard them lest they fall in wrong hands. Typically an outsourcing vendor will have security measures such as systems security, firewalls, and confidentiality agreements with staff, among others. It is always good to insist the safeguards an outsourcing company has in place. 5. Do you have happy customers and references? Often one of the easiest ways to judge a vendor is to know their track record with providing outsourced services. If they have a good record with keeping their customers happy then you can add them to your shortlist while compromising other drawbacks they may be having. Read Outsource2india's customer testimonials to see what our customers think of us.